B'Midbar/Numbers 34:17 "These are the names of the men who will take possession of the land for you ..."
The verb in the text, is a Qal 3mp prefix form from the root . Davidson lists three overlapping meanings: 1. to obtain, acquire a possession, to possess; 2. to obtain by inheritance, to inherit; 3. to divide for a possession, to apportion. is routinely used to describe the process of inheritance, from one generation to another, of taking possession of an inheritance, and the noun is translated as a possession, property or estate, an inheritance, portion or lot. We can see all three meanings at work in our text. The men that Moshe was instructed to select were to lead the tribes in taking physical possession of the Land; they were also to take up the inheritance of the Land that HaShem had promised to Avraham, Yitz'chak and Ya'akov; finally, they were to be involved in the allotting of the inheritance portions to the clans, families and individuals within their tribes. 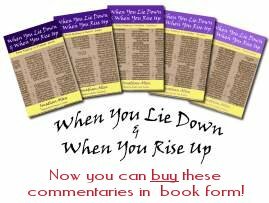 Friedman makes the comment that, "Over and over, the tribes and their leaders are named in this book of the Torah. From the wilderness period to the times of the judges to the time of the monarchy, Israel is never ruled by an individual political authority. There are always tribal chiefs, councils of leaders, priests, judges and military officers." HaShem defeated the army of the Egypt on behalf of Israel; they were not capable of fighting, so He fought in their place. He did what they could not do. Hirsch is even more definite: "the prince of every tribe is to 'take into possession' on behalf of his tribe, the portion of land allocated to it, and make the sub-division amongst the families and men who are entitled thereto." He sees the leaders as appointed representatives having full authority "to act for all claims of heritage, and their decisions are legally and finally binding." Hirsch points out that the Sages of the Talmud use this verse as the basis for the halacha that if a court appoints guardians to look after the estate of minors, then when the children reach their majority, they are not allowed to protest against the management of their estate because the guardians were appointed by the court so acted with the court's authority (b. Kiddushin 42a). The court intended to act in the interest of the minors to protect their inheritance, so appointed guardians to administer the estate on their behalf. Is this perhaps the idea that Rav Sha'ul had in mind when he wrote: "But G-d demonstrates His own love for us in that the Messiah died on our behalf while we were still sinners" (Romans 5:8, CJB). Knowing that we were powerless, being in effect His enemies because of sin, G-d appointed His Son to take the punishment of our sin "on our behalf" or "in our place". "He made Him who knew no sin to be sin on our behalf, that we might become the righteousness of G-d in Him" (2 Corinthians 5:21, NASB). G-d Himself decided what to do and then - in Messiah Yeshua - took the necessary action. His decision cannot be argued with or disputed; it is completely final, as the apostles explained: "And there is salvation in no one else; for there is no other name under heaven that has been given among men, by which we must be saved" (Acts 4:12, NASB). This idea does not always sit easily with man. Only weeks earlier, Yeshua and the talmidim had assembled for their Pesach seder. Before the meal started, Yeshua "rose from the table, removed his outer garments and wrapped a towel around his waist. Then he poured some water into a basin and began to wash the feet of the talmidim and wipe them off with the towel wrapped around him" (John 13:4-5, CJB). "Just a minute," Peter objects, "what do you think you're doing? You're not washing my feet!" This is not fair, not appropriate, not going to happen. No way! It was Peter who had spoken the words earlier in Yeshua's ministry that confessed Him as the Messiah, the Son of G-d. It could never be that the Messiah should wash Peter's feet. Yeshua tried to reason with him: "You don't understand yet what I am doing, but in time you will understand" (v. 7, CJB). Yeshua had used just about the same logic to His cousin John the Baptist when He came to him at the Jordan to be baptised at the start of His ministry: "Permit it at this time; for in this way it is fitting for us to fulfill all righteousness" (Matthew 3:15, NASB). But Peter persisted: "No! You will never wash my feet" (John 13:8a, CJB). Finally, Yeshua has to be more blunt: "If I don't wash you, you have no share with me" (v. 8b, CJB). What Yeshua is saying is that this the way that G-d has chosen to do things and that if Peter isn't prepared to do it that way, then he can't be part of what G-d is doing. Believers in Messiah are often criticised for being too exclusive. Tolerance is a modern tool that the enemy uses to blur the edges of the gospel by persuading believers not to present the world with the clear choice that G-d intends. Talk of heaven and hell, of judgement, sin and death, is considered old-fashioned and offensive; it constrains people's lifestyle choices and makes them feel uncomfortable. Worse, is not politically correct. I don't think that Yeshua was too fussed about political correctness, but was intensely concerned about people understanding the real issues of life and death and coming into relationship with Him. John the Baptist said: "Behold the Lamb of G-d who takes away the sin of the world" (John 1:29). Yeshua told His disciples: "I am the way, and the truth, and the life; no one comes to the Father, but through Me" (John 14:6, NASB). That is the truth, in black and white; take or leave it, but there is no halfway position. Yeshua is the way to our inheritance with G-d; He is the only way to possess the promises that G-d has made to us. Application: The time has long since passed for wishy-washy mealy-mouthed presentations of the gospel that please no-one; too mild to interest anyone, yet just enough to upset people by being made at all. How can you speak out and be bold in declaring the truth about eternal salvation and finding peace with G-d? Ask the Architect and Designer to show you His plans and tell you when to start shouting!